City suburbs with lake ecosystem. 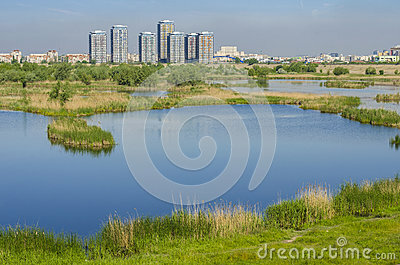 City suburbs with ecosystem Vacaresti Lake near south-eastern Bucharest with tall residential buildings on May 7, 2014 in Bucharest. Also known as the Delta of Bucharest, Vacaresti lake is a strange, intriguing raw nature island between communist blocks of flats in a southern district of Bucharest, covering around 200 hectares, including some 80 hectares of water; a stable ecosystem consisting of fish, wild ducks, swans, lizards and gulls where during the summer nest over 90 species of wild birds.